You plan the future of your business with purpose and precision. After all the time and money you’ve invested in finding, sourcing & selling your products, you naturally have a set an objective for the amount of profit you expect (or hope) to see in return. However, without thorough consideration of all the fees you might incur, you might end up facing an unpleasant surprise when you review your bottom line and discover your true ROI & margins. Especially as a seller who relies on Fulfillment by Amazon (FBA) to process your orders, you need to take the extra time to calculate your cost of selling on Amazon, and be mindful that it is an ever-changing target. To sharpen your business, we’re taking a look at the Amazon revenue calculator and how it can determine the Amazon FBA fees that often mean all the difference between turning a profit – or not. Let’s begin with a breakdown of the fees involved and what they actually cover. To really illustrate how FBA seller fees work, we’ll take two vastly different product examples to outline how they each incur fees throughout the FBA selling process. Let’s say you are a fitness enthusiast selling on Amazon and you are trying to decide between 2 different fitness related items to sell. You are considering selling a silicone wedding band similar to this, currently retailed at $7.97. Light in weight and small in size, this item is routinely used as an alternative to traditional metal bands while working out. On the other hand — no pun intended — take a medicine ball such as this, currently retailing at $33.53, not the largest item but weighing in at 10 pounds. The FBA revenue calculator is how as a seller you get a detailed view of your real-time fulfillment costs. Other charges — such as storage fees and seasonal changes — will, of course, influence the total further, which we describe in more detail later on. 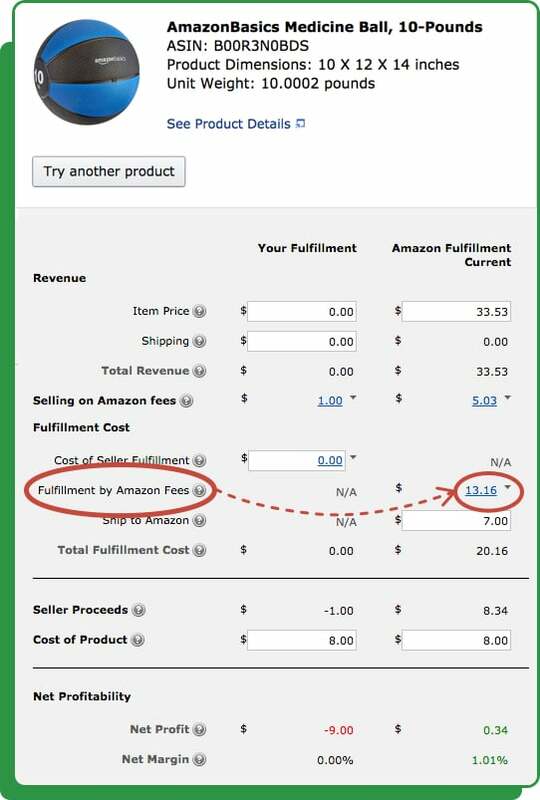 **Note: You can input your own fulfillment costs to see how they differ from Amazon’s if you are considering providing your own product fulfillment and shipping, but for this exercise, we’re looking at the Fulfillment by Amazon fees. Fulfillment fees depend firstly on the size and weight of each unit, whether Standard Size or Oversize. This ranges wildly from $2.41 (for an item of 1 lb. or less) to $137.32 (for Special Oversize items that weigh over 150 lb., are over 108 inches long or are over 165 inches taking into account its girth). Additionally, clothing items are charged an extra $0.40 per unit. Amazon rounds UP to the nearest pound because frankly, it makes them more money. So, a product that weighs 3lb 1oz is charged at the 4lb rate. You also need to consider your associated shipping costs. Inbound shipping costs are those that the seller incurs at the outset from buying inventory in bulk, often from a foreign supplier. The FBA calculator has the line item for product cost (or landed costs: the seller’s cost to acquire the unit, including unit cost and inbound shipping combined). Add these to the calculation so you can see your remaining profit. Divide that figure by your total landed costs to understand your potential ROI. Or, divide the remaining profit by your stated retail price to find potential Profit Margin. We’ve demonstrated how you can use the FBA revenue calculator to discover whether a product you’re considering selling is truly viable, but this really only scratches the surface of the potential this tool has to guide your sales strategy forward. At various points, you may be considering adjusting your price points or offering some kind of limited discount on specific items. Planning discounts, coupon codes, special offers — and what impact those will have on your profitability. Once you determine what you are going to sell, you need to make sure you are competitive in the market while maintaining an acceptable profit. You can easily do this by finding a competitor that sells a product similar in size, weight & category as yours. Grab a competitor’s ASIN and input that into the FBA calculator, along with your desired retail price & landed costs. You can use this to simulate the ideal price point for your own product to remain competitive while finding out what you can expect your fees (and profit!) to be as a result. Go ahead and give it a try with our silicone wedding band example for earlier. Here’s a competitor’s version of the same product. Plug those numbers into the FBA revenue calculator, and you’ll quickly see how the manipulation of your price and landed costs affect your fees and profits. FBA fees clearly aren’t negotiable, but being armed with this data may just give you a compelling edge when price negotiating with your suppliers on unit cost – or determining your best inbound shipping method. By now you’re feeling pretty smart, and indeed you are. But to keep things interesting (read: frustrating), remember that Amazon’s fee structure changes every six months. So it’s vital to your long-term success that you stay up to date with the latest developments in FBA, as this will certainly impact your future decisions on whether to continue selling a product that previously profited…or if the increased competition and FBA fees have brought this particular product’s life cycle to a close. Although Amazon sellers like yourself are informed of the fees you incur with regular reports, the sale-by-sale details remain murkier, as the cost may shift without warning. Amazon’s fees to the seller tend to increase over a long period of time, but note also they can also greatly fluctuate month to month, especially during the holidays. When you determine what product you want to sell, you can’t forget to consider monthly storage fees. Discussed earlier, the size and weight of your items can greatly influence your FBA fees. You’ll remember in the product showdown earlier, our preferred product to sell when solely looking at fulfillment fees was the wedding band based on its combined lower weight and small size. Looking above and applying to our example from before, the wedding band would again be our top pick in regards to both FBA fees + Storage Fees, hands down. Remember: FBA fees are impacted by size and weight, and storage fees are based on the daily average volume (measured in cubic feet) for the space your inventory occupies in fulfillment centers — and the particular month. FBA fees are charged per transaction, while monthly storage fees are charged, well, monthly. So when trying to accurately determine the total costs and fees associated with selling a product, in fairness you should count a proportional amount of your account’s overall monthly storage fees against each unit sold as well. The net effect will be a small shift downward of both ROI and Margin. Another thing to keep in mind is that you will begin to incur Long-Term Storage Fees for items stored in Amazon’s warehouses beyond 6 months. You’ll need to consider this when planning your inventory fulfillment schedule, or you’ll see your previous profits earned get burned up by Long-Term Storage Fees in subsequent months! Be very cautious here: these fees have the potential of turning a business upside down if you’re overstocked for long periods of time. While Amazon can be a terrific partner for you to distribute your products, Amazon FBA fees and storage fees play a critical role in your potential profitability calculations. To maximize your profitability, you need to develop a clear understanding of what products you choose to sell online and what your price point is going to be in order to build a successful and profitable FBA seller business. Additionally, what will help your business continue to thrive month-over-month and year-over-year is your ability to adjust your price points and inventory levels to reflect the changing fee landscape and to keep up with seasonality demands.